Arrange the numbers on the squares so that each of the three digit numbers formed horizontally are square numbers and each of the three digit numbers formed vertically are even. How many different ways can this puzzle be solved using these digits? Press the Clear button and try again. The numbers in the circles can be moved by dragging them using a mouse or your finger (if you have a touch screen or interactive whiteboard). With younger pupils, it is a good idea to begin with a reminder about square numbers. Also some practice with squares and square roots on a calculator. Next, give a simplified 4 digit version of the same problem. The digits 1, 4, 6, 8 work well. Now give the 9 digit version as in this starter. We love this website and we love this starter. It was very challenging and fun. One way to solve this problem using technology is to use a spreadsheet or a graphic display calculator to generate a list of all 22 three digit square numbers. Manually eliminate those that contain a 0, 3, 7 or 9 as those digits aren’t available. 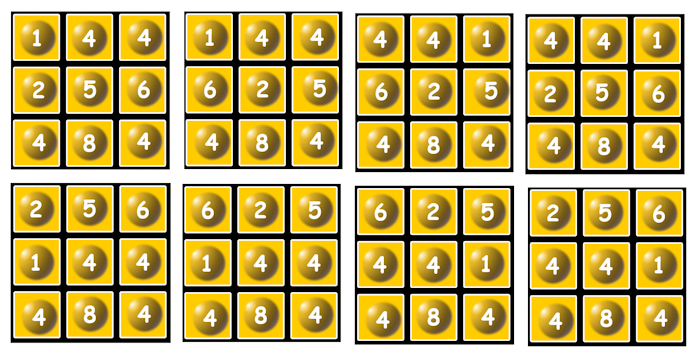 Only one of the 8 square numbers left is comprised of only even digits so this number must go in the bottom row of the grid. Eliminate square numbers from the list that can not be made using the remaining six digits. It is now quite easy to find all of the possibilities. Teachers, tutors and parents can see all of the possible answers below. This starter has scored a mean of 3.1 out of 5 based on 577 votes. Here is the URL which will take them to a game involving square numbers. Too difficult? Try the simplified version (two digit numbers).